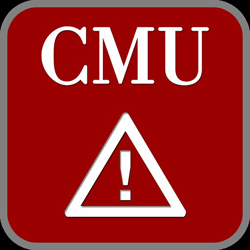 All IDeATe affiliates should download the CMU Mobile Alert app, available for iPhone and Android phones through the phone App Stores. Put the app on your home screen, because in an emergency, that’s where you’ll need it. Automatic dialing for University Police, Safety Escorts and 911. Some of the equipment in IDeATe requires the use of chemicals that may be harmful to you. Carnegie Mellon’s Environmental Health & Safety provides free training for those who work with potentially harmful chemicals. The Material Safety Data Sheets, located in binders in the IDeATe labs, provide information on the specific materials used in IDeATe. For each IDeATe lab that you work in, you should know the location and proper use of the electrical emergency stop (red e-stop), the first aid kit, the fire extinguishers, the sharps bin, the MSDS binder, and – for the fabrication lab – the eye wash station.